I promised you a set of designs based on one stamp. 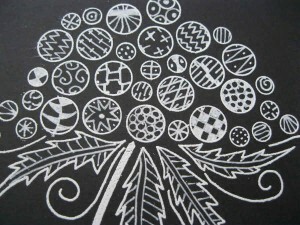 My chosen stamp is a Woodware Clear stamp called Bubble Bloom Clarissa. This fab stamp has lots of possibilities as it has all the bubbles to decorate. You will be seeing this stamp a lot over the next week as I have a head full of ideas on what you can do with it! I hope that it gives you some ideas to pull out some of your own stamps (or treat yourself to this one!) and have a play. The trick with a stamp is to look beyond just the first idea. Think about different colours and textures, different mediums you have in your craft box – inks, paints, pens embellishments. Different styles, modern, zentangle, vintage, bright, pastel, steampunk. There are often so many ways you can make a stamp look different if you just have the confident to have a play. Some ideas will work – some will not work so well – but you won’t know till you experiment. So – back to the Clarissa stamp. 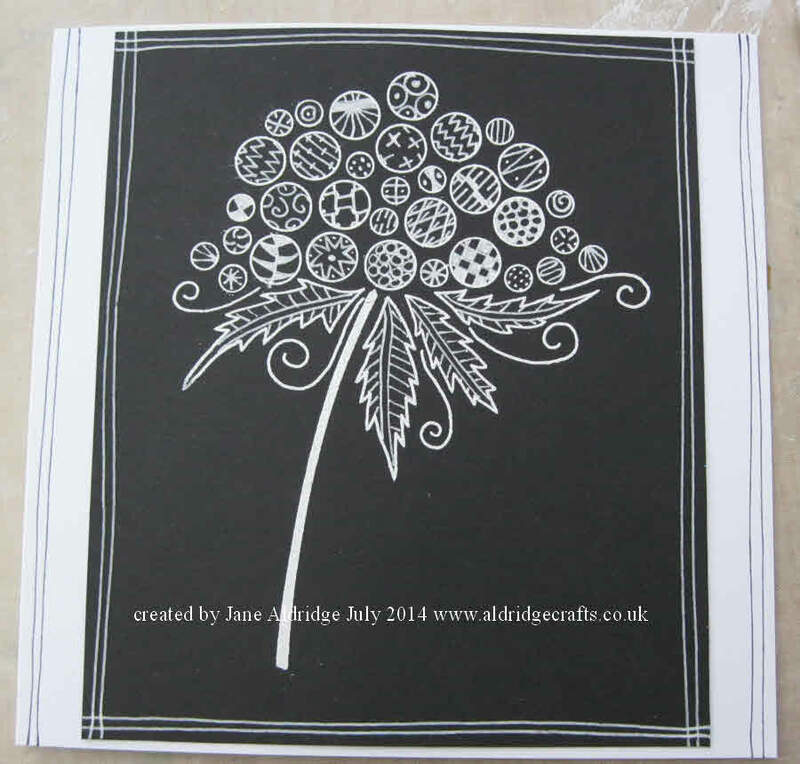 The first idea in my head was to zentangle – but as a change to do white on black. Would it work? Would my cheap and cheerful white gel pen (75p!!) be of good enough quality to stand up to the detail? 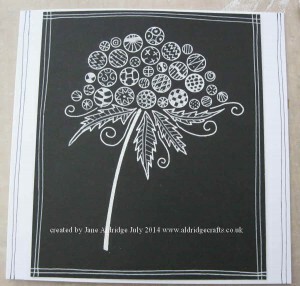 I started by stamping and embossing my design with white embossing powder onto black card. I then set to work putting patterns into the bubbles. I kept the patterns very simple – there isn’t enough room to get too complicated! However, simple zentangle patterns may not look much when you look at an individual circle, but when you look at a collection of patterned circles they look amazing! Come back again tomorrow for another design using the same stamp. PS – Mollydog update. Those of you following her progress – she has had another physiotherapy and hydrotherapy session this afternoon and they are so pleased with how quickly she is progressing! She is walking so much better and so much stronger! What a fun card! It looks great.